Studies conducted over the past few decades came to the conclusion that ferroelectricity and magnetism tend to be mutually exclusive, and interact only weakly with each other when they do coexist. The recent discovery of multiferroic materials, in which ferroelectricity and magnetism are intimately coupled, has completely changed these established views, opened routes to new technological applications, and has forced physicists to reconsider some long-accepted ideas . Coupling between magnetic and electric orders makes it possible to design promising devices, such as high-speed memories with magnetically and electrically addressable states, magnetically tunable tunnel-junctions, sensors, filters, transducers, etc. For instance, the control of magnetization by an applied electric field via the magnetoelectric coupling offers an opportunity to combine the respective advantages of FeRAMs (ferroelectric random access memories) and MRAMs (magnetic random access memories) in the form of non-volatile magnetic storage bits, which can be switched by an electrical field and thus combine the merits of MRAMs in terms of access time and endurance with a low writing energy . Meanwhile, a major effort is currently underway to revisit the ferroelectric-ferromagnetic dichotomy and to understand the multiferroic properties on fundamental grounds. The multiferroic compounds are scarce, as symmetry considerations impose severe constraints. Indeed, their space group should be non-centrosymmetric, to accommodate ferroelectricity, but also compatible with a magnetic ground state. Last but not least, all multiferroic materials found to date exhibit a certain amount of magnetic frustration. This, together with a strong spin- lattice coupling, seems to be a basic physical ingredient for multiferroicity. For example, the orthorhombic RMnO3 compounds, where R is a rare-earth element (R = Eu, Gd, Tb, Dy), are archetypes of multiferroic materials. Magnetic frustration arises from competing magnetic exchange interactions, yielding an incommensurable spiral magnetique structure. As proposed in the “spin-current” model, the spin-lattice coupling is a result of the Dzyaloshinskii-Moriya interaction: minimizing the corresponding term in the Hamiltonian of the system results in a relaxation of atomic positions and, in turn, in an electric polarization . S-W Cheong et al., Nature Materials 6, 13 (2007). A Barthélémy and M. Bibes, Nature Materials 460, 81 (2009). H. Katsura et al., Phys. Rev. Lett. 98, 027203 (2007). Figure 1. Experimental (color map) and calculated (grey lines) S(Q,ω) along the [HH0] direction in delafossite CuCrO2 at 10 K.
A rapid survey of the literature shows that there also exist a large number of multiferroic materials with a triangular-based geometry. Much work at LLB was thus devoted to the study of delafossite-type materials, such as CuCrO2 and CuMnO2, in close collaboration with the CRISMAT in Caen (Figure 1). These studies showed that the ground state properties of these compounds can be very different, even if the required basic ingredients are present. In CuCrO2 the magnetic ground state is an incommensurate 120° magnetic structure, with spin dynamics that is close to that of a 2D Heisenberg triangular lattice; it is multiferroic in its antiferromagnetic phase, but no unambiguous structural distortion was observed so far at TN . There are, however, anomalies in the spin-wave spectrum, which can be assigned to additional in-plane interactions, and could be an indication of a magnetoelastic coupling in this material. In contrast, the collinear antiferromagnetic ordering in CuMnO2 occurs simultaneously with a symmetry-lowering structural transition, which releases the frustration inherent to the triangular lattice. Below the magnetoelastic transition, CuMnO2 is an improper ferroelastic, but is not magnetoelectric . Even though the basic ingredients of multiferroicity (magnetic frustration and spin-lattice coupling) are at play, the balance between the two is subtle and remains unknown. More studies are in progress, focusing in particular on the role of the ligand ions on the magnetic interactions. M. Poienar, F. Damay, C. Martin, J. Robert, and S. Petit Phys. Rev. B 81, 104411 (2010). F. Damay, M. Poienar, C. Martin, A. Maignan, J. Rodriguez-Carvajal, G. André, and J. P. Doumerc, Phys. Rev. B 80, 094410, (2009). Figure 2. Energy scans performed at the zone center Q = (0,0,6) in YMnO3, in the spin-flip (red) and non-spin-flip (blue) channels. Left and right curves correspond to temperatures above and below TN, respectively. The spin wave is in reality a hybrid mode, as evidenced by its “lattice” counterpart (bottom right). Hexagonal RMnO3 with R elements having smaller ionic radii, (R = Ho, Er, Yb, Lu, Y) form another class of triangle-based multiferroic materials, which has been widely studied at LLB in recent years, in collaboration with the Institut de Chimie Moléculaire et des Matériaux d'Orsay (ICMMO University of Paris-Sud 11) .The Néel order at 120° imposed by the geometric frustration is accompanied by an isostructural transition: each ion “moves” inside the unit cell when Mn moments get ordered. 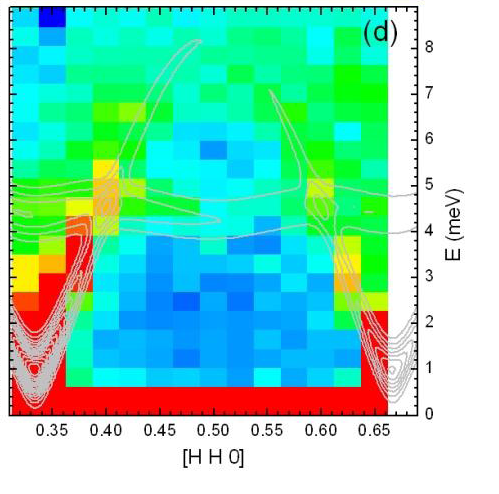 This effect provides evidence for a giant magnetoelastic coupling, likely connected with an increase in the ferroelectric polarization. To shed light on these materials, high-resolution neutron diffraction and inelastic neutron scattering were carried out on four RMnO3 compounds (R = Y, Sc, Ho, Yb), with either non-magnetic (Y, Sc) or magnetic (Ho, Yb) R ions, showing (Ho, Sc) or not (Y,Yb) a spin reorientation at the temperature TSR (Figure 1.9). We have shown that the isostructural transition is a systematic feature in this series. In addition, we have established a correlation between the atomic positions, the type of magnetic structure, and the nature of the spin-waves, depending on the compound and its magnetic structure. The key parameter is the position of the Mn ions within the triangular plane, which tunes the sign of the exchange interaction. We speculate that, thanks to the magnetoelastic coupling, the atomic motion helps to release the frustration by selecting one particular magnetic structure, depending on the x value . This process recalls the spin-Peierls states stabilized in several geometrically frustrated 2D or 3D compounds. Magnetoelectric coupling also results in mixed magnon-phonon excitations, called electromagnons. While their existence has been theoretically predicted a long time ago, their dual lattice and spin nature makes it challenging to observe them experimentally. Due to their dipole electric activity, they could first be detected by optical measurements, especially in GdMnO3, TbMnO3, Eu0.75Y0.25MnO3, DyMnO3, YMn2O5, TbMn2O5 and BiFeO3. 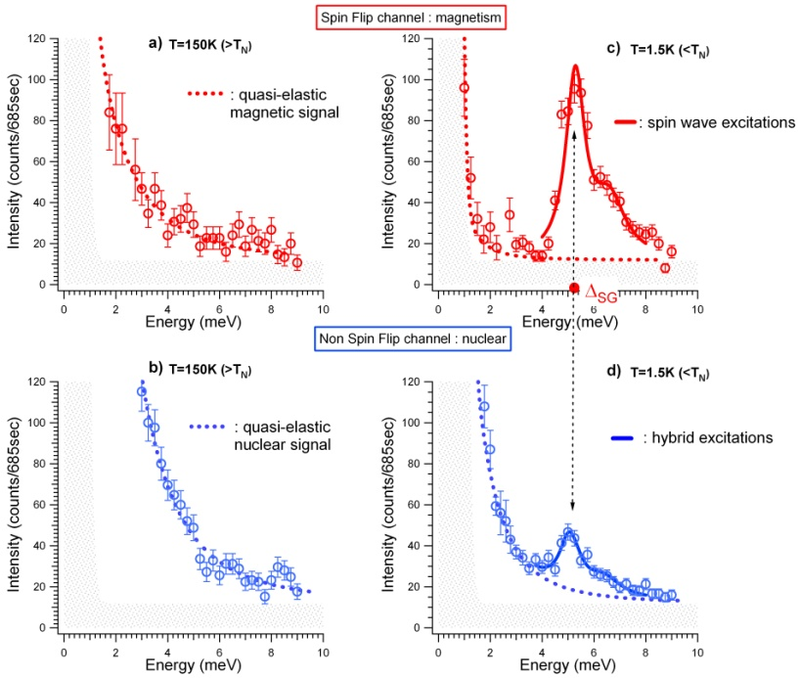 Recent inelastic polarized neutron scattering experiments provided one of the first direct observations of a hybrid dispersive wave in the hexagonal series of RMnO3 materials: part of a spin-wave branch is found to be completely dressed by nuclear spectral weight . Again, the Dzyaloshinskii-Moriya interaction could be at the origin of this hybridization. S. Petit, F. Moussa, M. Hennion, S. Pailhès, L. Pinsard-Gaudart, and A. Ivanov, Phys. Rev. Lett. 99, 266604 (2007). X. Fabrèges, I. Mirebeau, P. Bonville, S. Petit, G. Lebras-Jasmin, A. Forget, G. André, and S. Pailhès, Phys. Rev. B 78, 214422 (2008). S. Pailhès, X. Fabrèges, L. P. Régnault, L. Pinsard-Godart, I. Mirebeau, F. Moussa,M. Hennion, and S. Petit, Phys. Rev. B 79, 134409 (2009). X. Fabrèges, S. Petit, I. Mirebeau, S. Pailhès, L. Pinsard, A. Forget, M. T. Fernandez-Diaz, and F. Porcher, Phys. Rev. Lett. 103 067204 (2009).